Even if you've never heard of the Mexican state of Guerrero, you are bound to have heard of Acapulco. Back in the 1950s, this beach resort grew to be hugely popular with such Hollywood greats as Elizabeth Taylor and Rock Hudson. Whilst Acapulco has perhaps lost some of its original splendour, there is still a whiff of glamour about the place that continues to attract the rich and famous, and indeed anyone who wants to breathe in a little of Acapulco's atmosphere. Away from the coast and places like Acapulco, Guerrero is covered almost completely by mountains. Scattered around the landscape are over 1,700 archaeological sites. Only a handful of these are open to the general public, the best known being La Organera Xochipala. Like most places in Mexico, Guerrero is trying to shake off its image as a high-crime area. Tentative steps are being taken into the world of ecotourism. And whereas once it would have been nigh on impossible to try out some extreme sport or other in Guerrero, nowadays, visitors are faced with several options. The Cacahuamilpa National Park has also become something of a centre for caving enthusiasts, although you don't necessarily have to be an expert to explore some of its more accessible tunnels. This part of Mexico takes its handicrafts very seriously - they play an important part in Guerrero's economy, with many families depending on them for their livelihood. Woven and embroidered clothing can be found in abundance in the main tourist areas, as can bags crafted from palm leaves and furniture that has been lacquered within an inch of its life. In jewellery shops, more upmarket gold and silver jewellery jostles with handmade costume trinkets. 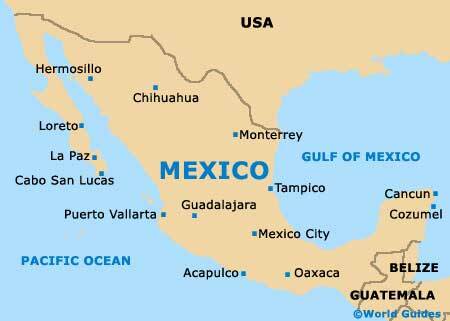 Officially known in Mexico as 'Acapulco de Juarez', Acapulco is a popular resort, which has established itself around an arching bayfront. Beachfront hotels are a big part of the city, as are quality Mexican restaurants and Quebrada's cliff divers.